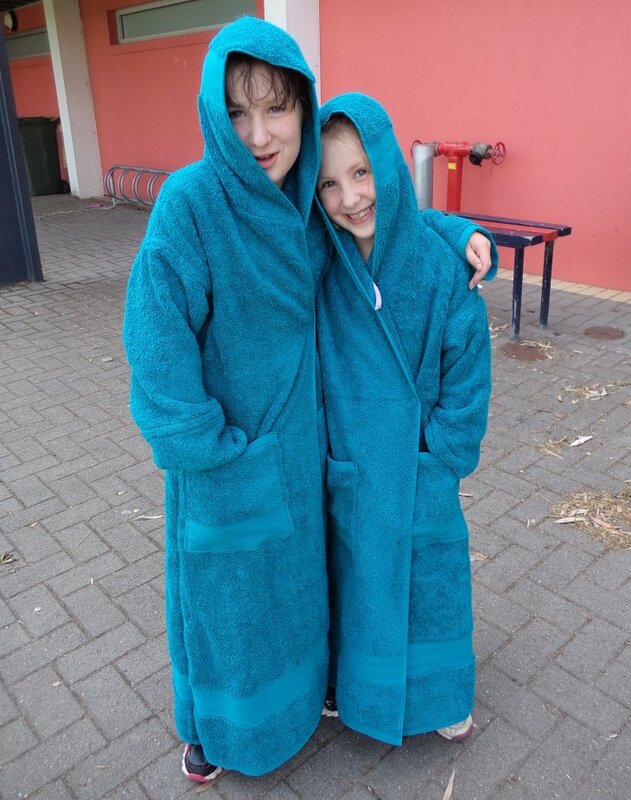 My children have started swimming lessons again, in an indoor heated pool. 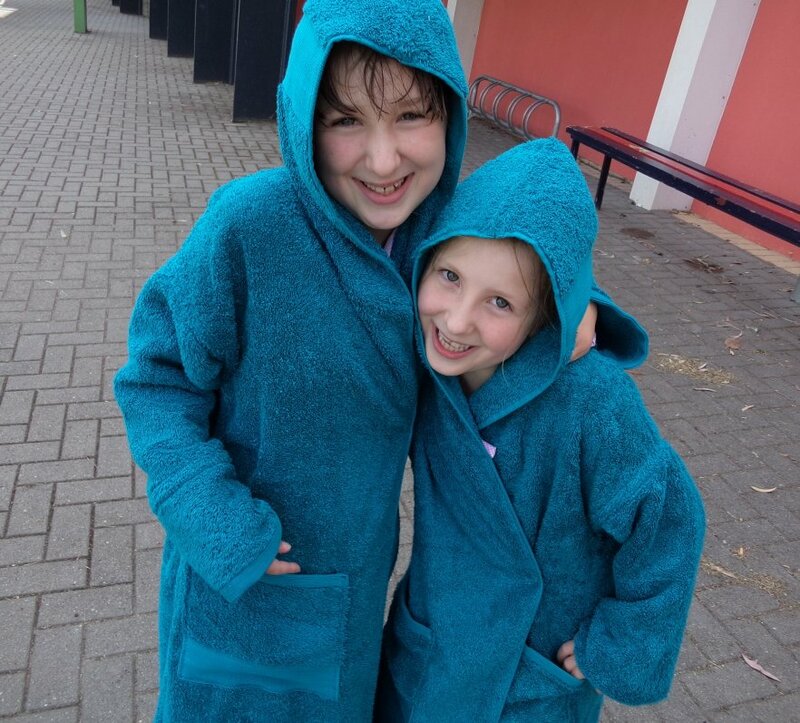 After their lesson they get in the car with their towels, then shower and change at home. 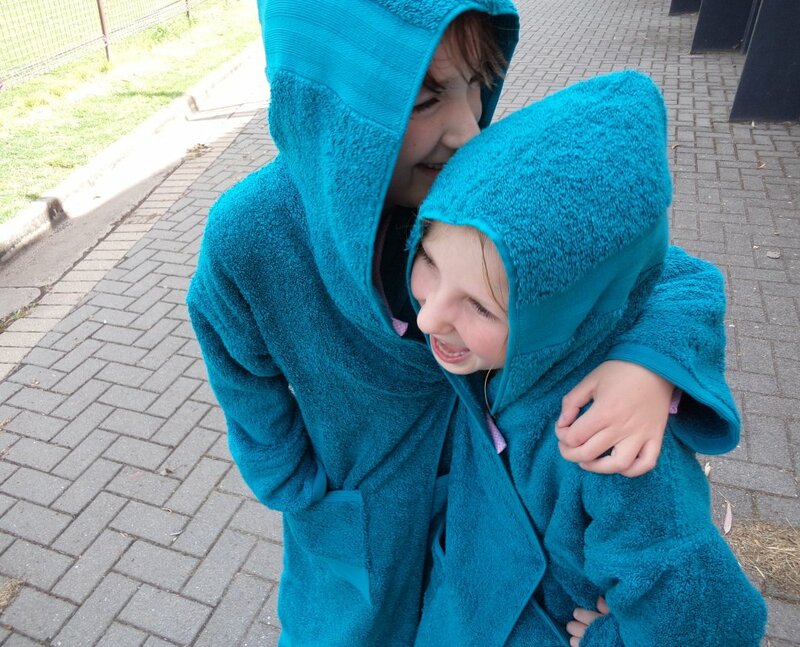 I had in mind to make them some sort of toweling dressing gown to wear after their swim. 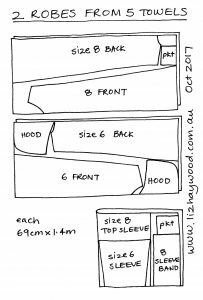 The sewing brief: long, robe-like, hooded, long sleeves, must have big pockets (for goggles, swimming pass, post-swim museli bar etc). The availability of toweling fabric here is about the same as snow (ie zero). For fabric, I bought five bath towels from Target (69cm x 1.4m), all the same colour. I would have liked them to choose their own colour dressing gowns, but it worked better to cut two gowns together. 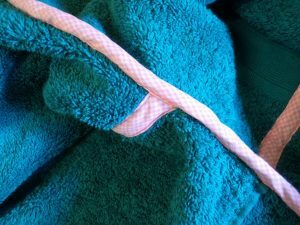 Besides, it was slim pickings in Target’s towel department re: colours. Looks like greys and pale neutrals are trending this season. 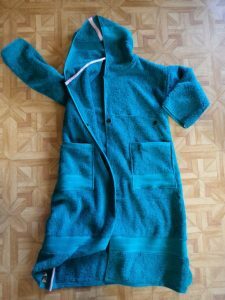 For a pattern I adapted a hooded dressing gown pattern I’d made some time ago (the hood is from this free pattern). I utilized the hems of the towels wherever I could: the body and sleeve hems, the front edges and the edges of the hood. 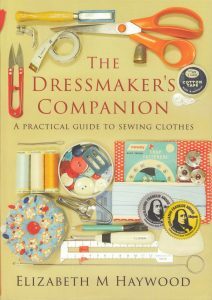 There’s a narrow lapped seam down the centre back. To finish the raw edges I bound them, which wasn’t as tedious as it sounds. 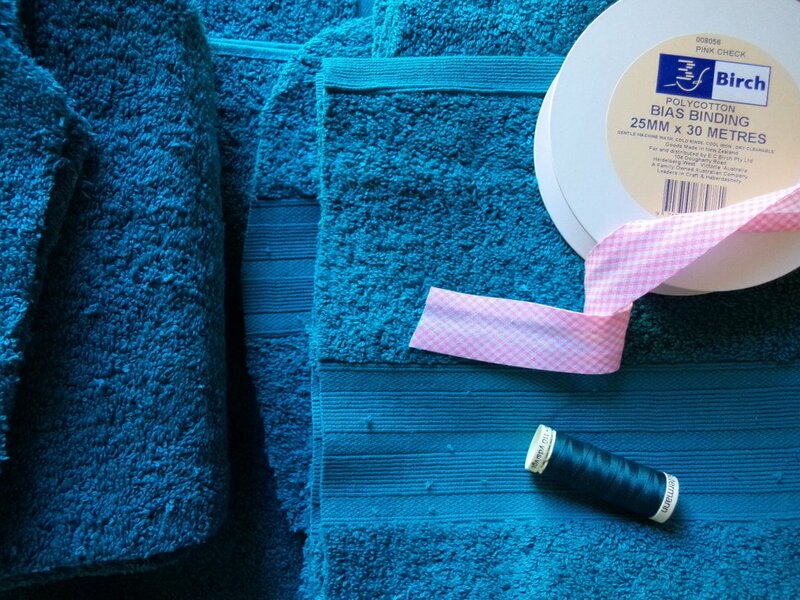 I had a big roll of 1″ wide bias binding that Mum gave me. I laid one edge of it on each seam as I sewed (the seam allowances were only 6mm). 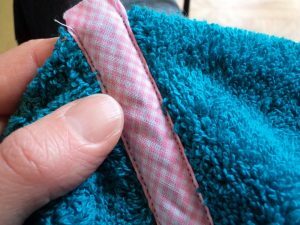 I used a size 16 needle because the toweling was so thick. 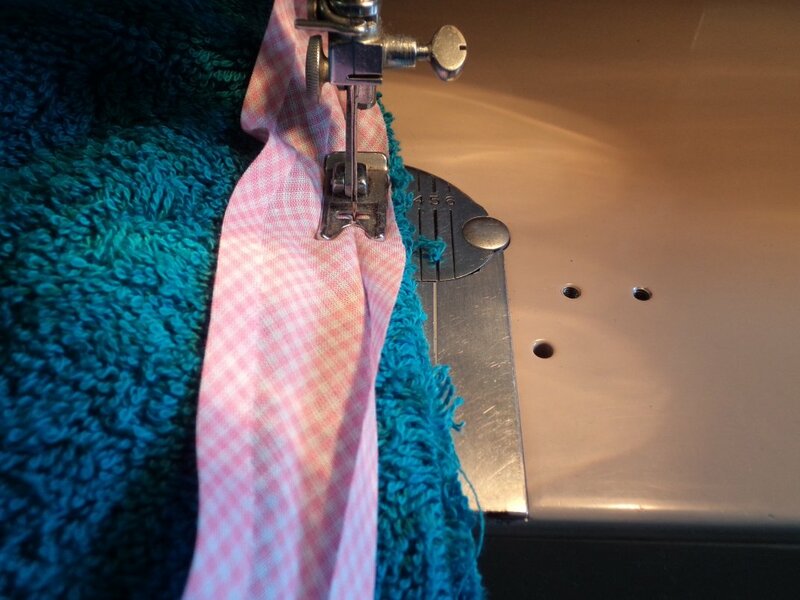 For a flat finish, I pressed the 6mm seam allowance open and stitched the binding on top, one row down each side. 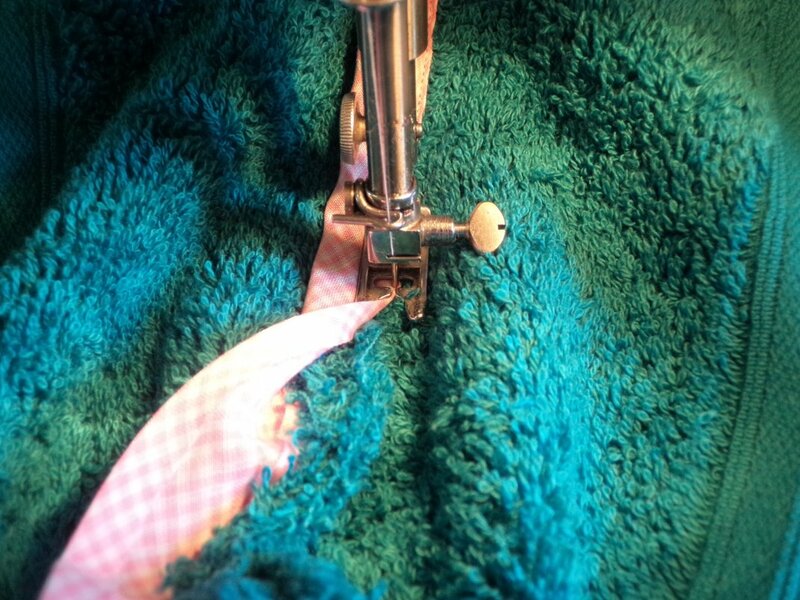 The binding exactly fitted over the open seam. This isn’t an “orthodox” method of sewing binding, but I made it up on the spot and it worked. Or, I simply bound the seam allowance. 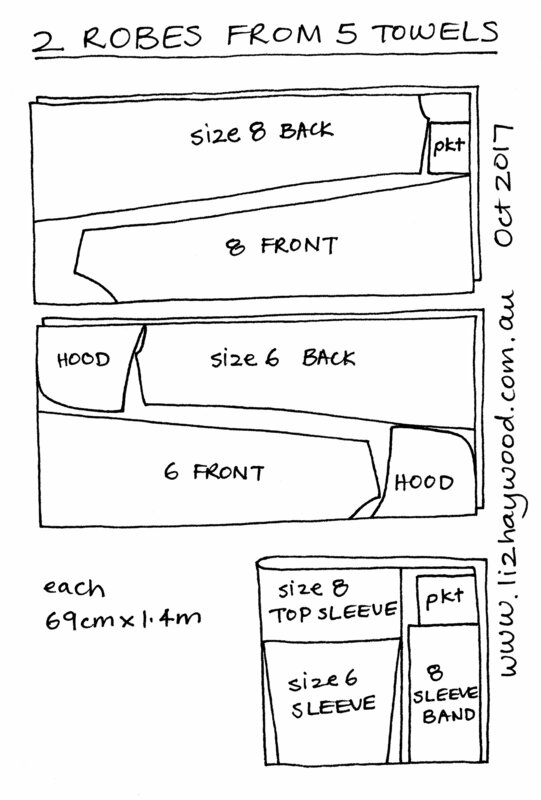 I only did this for the neck seam and the underarm/side seam; all the rest I made flat. The toweling made heaps of crumbs! 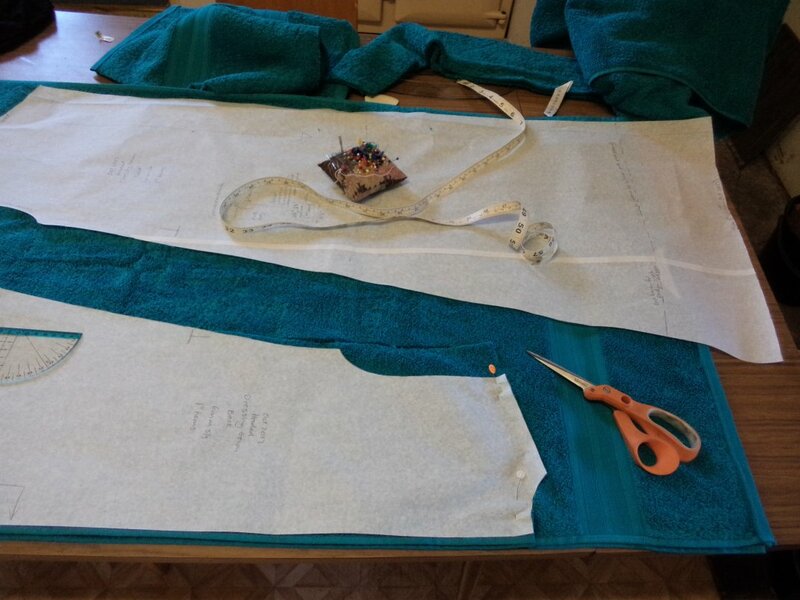 I had hoped to cut and sew in one session then have a big clean up, but I had to stop and make dinner. Seeing as I cut and sew in the kitchen, this meant having a clean up so the crumbs didn’t get walked through the rest of the house. For the front closure, I’ve discovered children aren’t very good at bathrobe tie-belts, so I lapped over the front with two giant press studs. Part way through sewing, I worried that the gowns would be too heavy to wear. Didn’t need to worry; they loved them!